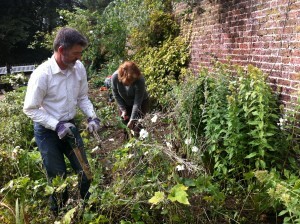 We held our first work day in the White Garden last Friday. Thirteen volunteers worked alongside Lambeth Parks to remove plants and start digging over the soil in preparation for the new design. We removed some of the large shrubs (such as the Asmanthus and Lilac) that are casting too much shade over the garden plus numerous smaller plants that do not form part of the new design. Many of the plants have been potted up in the community garden and Patrick and Colin, the Park Gardeners, are going to try and find homes for them elsewhere in the Rookery. Amongst the undergrowth we discovered all kinds of wildlife including a timid green frog, a family of newts and numerous creepy crawlies. We made sure we left some plant debris behind so the creatures still had somewhere to hide. A friendly robin watched over the proceedings and pecked away at the freshly turned soil. 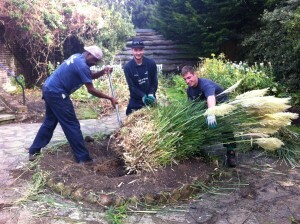 The main event of the day was undoubtedly the removal of the pampas grass. Rather surprisingly it was not too difficult to remove and the three gardeners who had been delegated this difficult task saw it away in a matter of minutes. Well done them! The work continues this Thursday when a group of volunteers from Lloyds Bank will be digging in 10 tonnes of mushroom compost. If you would like to see the work in progress, or even lend a hand, then come to the White Garden between 10am-3pm. It’s so exciting to see this work starting! Well done Charlotte, Lambeth Parks and especially all those hard working volunteers.